Choosing just the right stain color for your deck can be quite a challenge, but certainly the process isn’t beyond the capabilities of most do-it-yourselfers. No doubt, painting your own home or deck can be a very rewarding experience although there are several things that might go wrong if you fail to take the time to plan the operation carefully. Choosing the correct color solely depends on your tastes and personality, although you can try to read some books on color theory or even consult with an expert. Generally, there are three factors that affect the correct color choice: number of applications, correct shade and coloring tools. The very first thing you’ll have to do if you want to paint your own deck is to choose the shade and color you want. Keep in mind that the faded color on someone else’s deck might look very different from the color inside the can and it’s always a good idea to trust the shade card over the color printed on the can itself. A deck paint job can really look quite bad if you happen to either over-paint or under-paint the deck. To get just the right look, you’ll need to understand some fundamentals of painting. Many contractors seem to think that the more coatings, the better although this is not always the case. Most deck paints actually penetrate through the wood’s surface and over-coating the wood can lead to the formation of a single, very thick layer which can easily peel off. Also, in the case of water-repellent paints, over application can quickly lead to a very waxy or sticky surface. The two most important coloring tools you’ll need for this job are the deck brush and deck sprayer. An old rod or stick can work nicely enough as a stirrer. Then, find a set of overalls and some tissues, and you’re set. 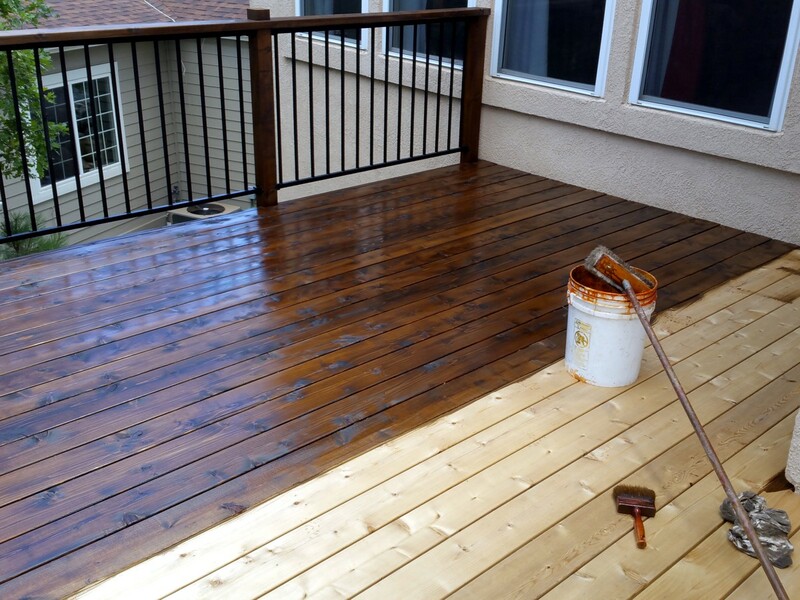 The deck brush and sprayer are the most important tools for a deck staining project and you’ll have to spend some time in choosing just the right set. There is a wide range of different models available to you, so you shouldn’t have a problem finding just the right ones. One other thing you’ll want to keep in mind is that if you’re using a mix of different colors for your deck and deck, apply the paint on the fence first before moving on to the deck as the paint on a vertical surface has a tendency to drip.